Mary (?) married Wiley Stevens. Her married name was Stevens. [S1249] United States Federal Census, Washington, District of Columbia, Population Schedule: Greenville, Greenville, South Carolina; Emuneration District: 23-49, Supervisor District: 2, Sheet: 20B, Dwelling: 387; Family Number: 424, Date: 1930. Ola Mae Bagwell was also known as Ola May Bagwell.3 She was born on 4 February 1892 in North Carolina.1,3 She was the daughter of Henry Watkins Miller Bagwell and Fannie McCadney Pool.1,3 Ola Mae Bagwell married Harvey Holder on 16 April 1905. As of 16 April 1905,her married name was Holder. 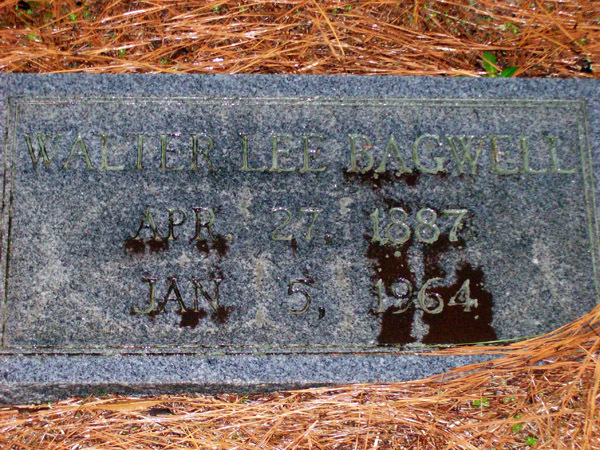 Ola Mae Bagwell died on 17 March 1986 at age 94.2 She was buried at Bagwell Cemetery, Garner, Wake County, North Carolina. [S551] Dallie Bagwell, Number: 238-64-1048, SSDI: Dallie Bagwell, unknown series. [S550] The News and Observer, September 20, 2006. 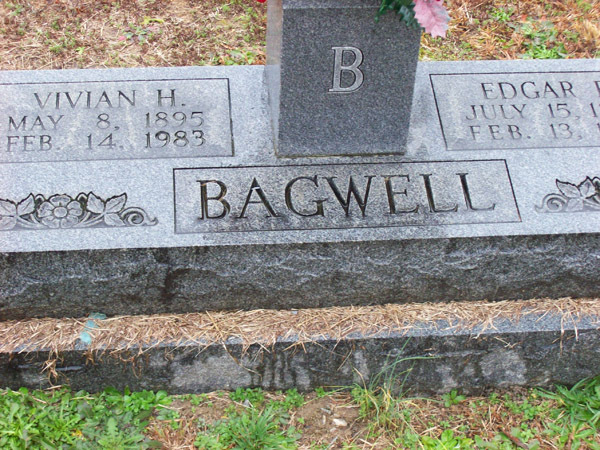 Guy Owen Bagwell was born on 22 July 1894 in North Carolina.1,2,3 He was the son of Henry Watkins Miller Bagwell and Fannie McCadney Pool.1,3 Guy Owen Bagwell married Mamie Hicks on 12 February 1920 at Wake County, North Carolina.3 Guy Owen Bagwell died on 1 July 1976 at age 81.2,3 He was buried at Oakwood Cemetery, Raleigh, Wake County, North Carolina. 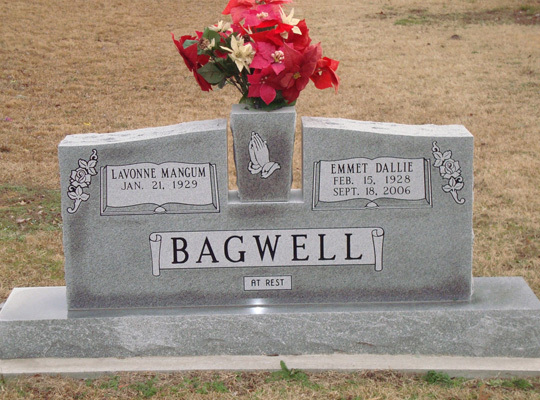 Joseph Lawrence Bagwell was also known as Lawrence Bagwell.2 He was born on 10 June 1921 in Wake County, North Carolina.3,1,2 He was the son of Dallie Lee Bagwell and Pearl Maden Glenn.2 He served in the US Marine Corps during World War II. Joseph Lawrence Bagwell married Ruby Mae Batts on 14 September 1947.1,2 Joseph Lawrence Bagwell died on 10 May 1991 in Raleigh, Wake County, North Carolina, at age 69. 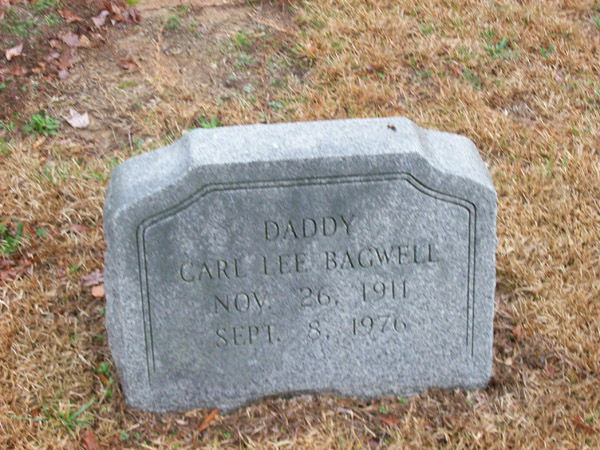 He was buried at Ebenezer United Methodist Church Cemetery, Garner, Wake County, North Carolina. Margaret Bell Bagwell was born on 8 September 1916 in Wake County, North Carolina.1,2 She was the daughter of Dallie Lee Bagwell and Pearl Maden Glenn.2 As of 10 February 1940,her married name was Phillips. Margaret Bell Bagwell married Douglas Ludlo Phillips on 10 February 1940 at Wake County, North Carolina.1,2 Margaret Bell Bagwell and Douglas Ludlo Phillips lived in Rock Quarry Road, Wake County, North Carolina.1 Margaret Bell Bagwell died on 30 June 2005 in Garner, Wake County, North Carolina, at age 88. Douglas Ludlo Phillips was born on 28 August 1918.2 He was a tobacco farmer at Wake County, North Carolina.2 He married Margaret Bell Bagwell, daughter of Dallie Lee Bagwell and Pearl Maden Glenn, on 10 February 1940 at Wake County, North Carolina.2,1 Douglas Ludlo Phillips and Margaret Bell Bagwell lived in Rock Quarry Road, Wake County, North Carolina.2 Douglas Ludlo Phillips died on 14 March 1986 at age 67. Willie Eldrie Bagwell was also known as Eli Bagwell.2 He was born on 8 September 1916 in Wake County, North Carolina.1 He was the son of Dallie Lee Bagwell and Pearl Maden Glenn.2 Willie Eldrie Bagwell married Elsie Mae Poole on 25 December 1940.1,2 Willie Eldrie Bagwell died on 18 August 2000 in Raleigh, Wake County, North Carolina, at age 83. He was buried at Ebenezer United Methodist Church, Wake County, North Carolina. Elsie Mae Poole was born on 21 August 1916. 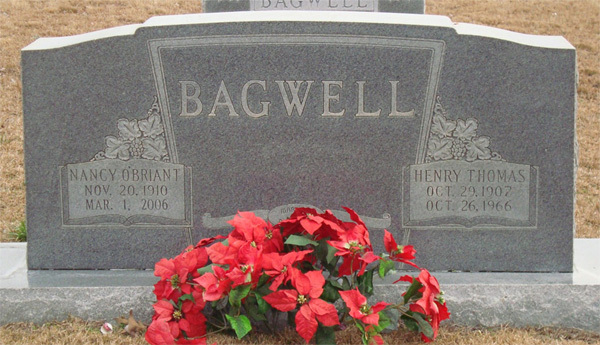 As of 25 December 1940,her married name was Bagwell. She married Willie Eldrie Bagwell, son of Dallie Lee Bagwell and Pearl Maden Glenn, on 25 December 1940.1,2 Elsie Mae Poole died on 13 November 1991 at age 75. She was buried at Ebenezer United Methodist Church, Wake County, North Carolina. [S2197] Email from Barbara Gail Bagwell dated February 2012 to Hunter Wayne Bagwell - Subject Line: Descendents of Dallie Lee Bagwell. Cecil Mildred Cox was born on 18 December 1910 in Johnston County, North Carolina. 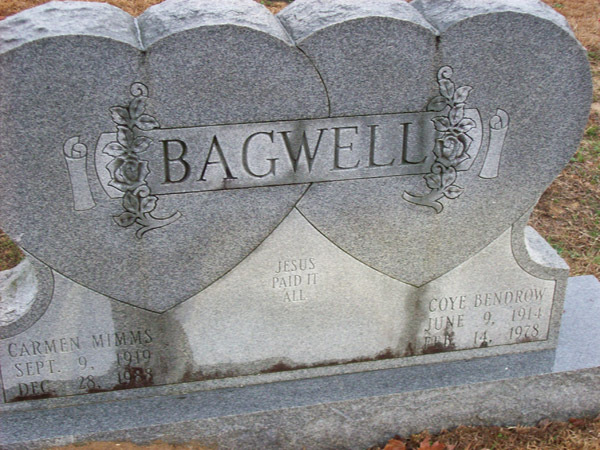 As of 17 March 1934,her married name was Bagwell. She married Carl Lee Bagwell, son of Dallie Lee Bagwell and Pearl Maden Glenn, on 17 March 1934.1,2 Cecil Mildred Cox and Carl Lee Bagwell were divorced in 1951.1 Cecil Mildred Cox died on 16 April 1971 in Goldsboro, Wayne County, North Carolina, at age 60. Edward Horice Bagwell was also known as Horice Edward Bagwell.1,2 He was born on 28 December 1909 in Wake County, North Carolina.1,2 He was the son of Dallie Lee Bagwell and Pearl Maden Glenn.2 Edward Horice Bagwell married Louise Mae Poole on 11 June 1935 at Wake County, North Carolina.2 Edward Horice Bagwell died on 3 May 1992 in Garner, Wake County, North Carolina, at age 82. He was buried at Ebenezer United Methodist Church, Wake County, North Carolina. Lillie Myrtle Bagwell was also known as Myrtle Bagwell.2 She was born on 15 June 1905 in Wake County, North Carolina.1,2 She was the daughter of Dallie Lee Bagwell and Pearl Maden Glenn.2 As of 1 September 1927,her married name was Poole. Lillie Myrtle Bagwell married Mortimer P. Poole on 1 September 1927.1,2 Lillie Myrtle Bagwell died in Raleigh, Wake County, North Carolina. Millie Bryan was born on 23 August 1924. 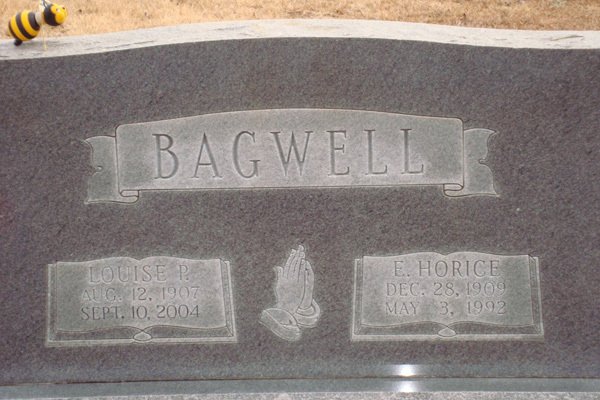 Her married name was Bagwell. She married Leon Owen Bagwell, son of Dallie Lee Bagwell and Pearl Maden Glenn, on 13 April 1945.1,2 Millie Bryan died on 6 February 2007 in Durham, North Carolina, at age 82. Ruby F. Bagwell was born on 12 November 1915 in Wake County, North Carolina.1 She was the daughter of Edgar Bryant Bagwell and Vivian Grace Holder.1 As of 23 December 1937,her married name was Poole.1 Ruby F. Bagwell married Millard J. Poole, son of Charlie H. Poole and Etta Riddish, on 23 December 1937.1 Ruby F. Bagwell died on 18 March 1998 in Raleigh, Wake County, North Carolina, at age 82.